Deep neural networks (DNNs) are proving very effective for a variety of challenging machine perception tasks, but these algorithms are very computationally demanding. To enable DNNs to be used in practical applications, it’s critical to find efficient ways to implement them. 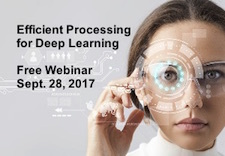 The Embedded Vision Alliance will delve into these topics in the free webinar, "Efficient Processing for Deep Learning: Challenges and Opportunities," on Thursday, September 28 at 10 am Pacific Time. This webinar explores how DNNs are being mapped onto today’s processor architectures, and how both DNN algorithms and specialized processors are evolving to enable improved efficiency. It is presented by Dr. Vivienne Sze, Associate Professor of Electrical Engineering and Computer Science at MIT (www.rle.mit.edu/eems). Sze will also offer suggestions on how to evaluate competing processor solutions in order to address your application and design requirements. To register, see the event page.